Receive One-on-One Expert Advice for up to One Full Hour by Top Nurse Injectors in Arizona who have Injected Over 20,000 Satisfied Customers Without a Major Issue at the Nation's Premier Spa with Over 5,000 5-Star Reviews! Click Here to Learn More. Botox® is a prescription medicine, known as a Neuromodulator, that is injected into muscles and used to improve the look of moderate to severe frown lines between the eyebrows (Glabellar lines) in adults for around 90 to 120 days. Botox® can significantly relax expression lines, and other unwanted wrinkles. 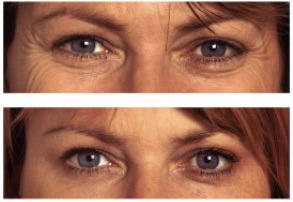 Botox® can also revitalize and "lift" certain facial muscles. Botox® can make a dramatic difference in your appearance with just one treatment! BOTOX® treatments do more than just reverse lines and wrinkles. Wrinkles such as worry lines, laugh lines, neck lines, crow's feet and neck bands are caused by muscles under the skin contracting when we laugh, smile or express emotions facially. BOTOX® is so effective because it works on the root of the cause, the muscles. BOTOX® temporarily weakens the skin's muscles, reducing its ability to contract. No contractions mean no wrinkles, and skin smoother, tighter and wrinkle-free skin. Allow our practitioners to "lift" your eyebrows, erase the "11's" between your eyes, plump and beautify your upper lip to revitalize your "cupid's bow" and at the same time, lift your upper lip area. Ever notice how your top lip gets longer as the years go by? Lifting the lip usually only takes 5 units of Botox® Cosmetic. And, those little vertical lines on the upper lip? Also known as "smoker's lines" unfairly, even if you never smoked, can be banished with Botox® Cosmetic Fillers. We can reduce jowls, relax lines on your neck, and truly seemingly erase years, after just one treatment. Our premium-quality BOTOX® treatments in Scottsdale Arizona are administered in a modern, well-equipped and hygienic facility, with the help of skilled technicians trained in medical beauty. BOTOX® treatments aren't long, drawn-out procedures that require extensive pre and post follow-up appointments. Thanks to advances in medical beauty, BOTOX® treatments are as simple as getting a shot. Our customers typically see results in three to five days, however, it may take up to 14 days in some cases, although that's rare. The treatment lasts for three to four months. Patients who repeat the treatments every few months over a period of time and follow suggestions and recommendations typically see longer-lasting results. BOTOX® treatments are safe, easy to administer, and have no harmful side effects. And the best part is, it only takes a few minutes. Depending on the severity and area of the wrinkles, you'll be up and away in ten to twenty minutes, with just a few BOTOX® injections. BOTOX® is a registered trademark of Allergan, Inc.
Beautify Spa is the first Med Spa in the United States to attain over 5,000 5-Star Reviews. We only hire the Best-of-the-Best Nurse Injectors, because we feel your face & look is too important. We take all the time necessary to help achieve a natural appearance and freshen your look, not an over-injected look. We also give you a complimentary 2-Week Follow-up appointment to help insure you are happy. NEVER get injected by a Newbie Injector with only a year or so experience. Click Here to Read Our Reviews! According to the American Society of Aesthetic Plastic Surgeons, about 10 percent of all cosmetic procedures performed in the United States in 2012 were on men - that is almost 1 million cosmetic procedures. The number of cosmetic procedures for men increased by 106% since 1997. 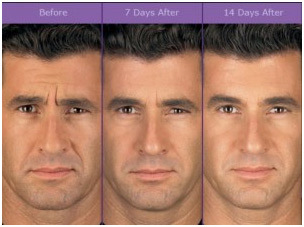 BOTOX® Cosmetic has also been clinically evaluated in male patients. 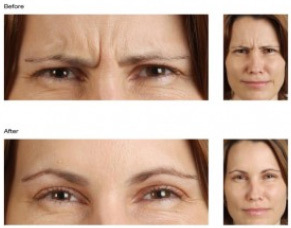 In clinical studies for moderate to severe frown lines, 17.5% of patients treated with BOTOX® Cosmetic were men. In the clinical studies for moderate to severe crow's feet, male patients comprised approximately 10% of patients treated with BOTOX® Cosmetic. And, here's some more good news regarding using Botox® Cosmetic. After establishing your initial treatments and developing a regular treatment program, the more effective your future BOTOX® Cosmetic treatments will be. Like any muscles, our facial muscles, if unused, become weaker. This means that we can soften and weaken the "bad muscles" that age us. Most patients report less need for repeat treatments after initial treatments are established. Botox® Cosmetic has also been proven as effective medical treatment for Hyperhidrosis (excessive sweating to any part of the body). Patients routinely come in for treatment every six months. Additionally, effective relaxation of muscles on the skull can reduce the frequency and severity of migraine headaches. By pinpointing exact points of pain and pressure we are able to inject at the site to reduce the severity of pain. 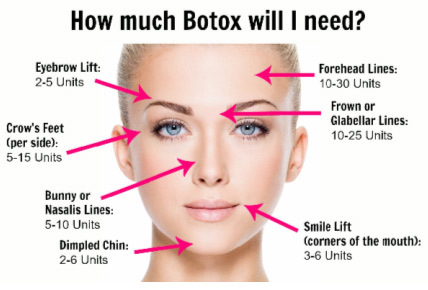 Botox® Cosmetic is reconstituted daily for use and is sold by the "unit", which is a liquid injection measurement. The need for units is mandated by the strength of the muscles to be relaxed, so it is an individual measurement. An approximate cost can be estimated for the patient prior to the treatment. Call today to Book! The combination of Botox® Cosmetic with a facial filler, such as JUVEDERM� Ultra, or Radiesse® can be even more dramatically rejuvenating! While relaxing the lines on your face, and lifting sagging facial muscles, such as eyebrows, we can also add volume, lift your cheeks, fill out your lips, and more, all in one treatment session. Hollowed eyes, distinct tear troughs, sagging hollow cheeks�.all can be treated effectively with our "Syringe Therapy", combining Botox® Cosmetic with Radiesse, and/or JUVEDERM Ultra. Vitamin E and all multi-vitamins containing Vitamin E. Foods high in Vitamin E should also be avoided such as: sunflower seeds, dry roasted almonds, olives, papaya, spinach, arugula, broccoli, blueberries, cinnamon and horseradish. Work the Botox® into the muscles treated, i.e. forehead (raise and lower your eyebrows), frown (move brows in and out) and crow's feet (smile and relax) repeatedly. Do not wear a hat, baseball cap, visor or a headband as this will push the Botox® down, resulting in a lower brow.